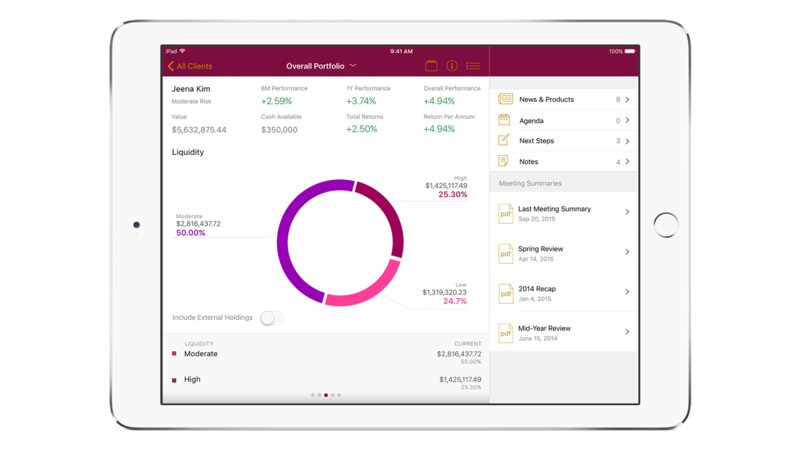 IBM MobileFirst for iOS Trusted Advice enables wealth advisors to provide a fully analytic, scenario-based and graphic-rich financial planning session. It allows advisors to access and manage client portfolios and gain insights from the app’s powerful predictive analytics. Trusted Advice is a mobile app so advisors can meet clients anywhere, while still having access to a wealth of interactive information. Advisors can now test recommendations with sophisticated modeling tools all the way to complete, secure transactions. The app’s advanced analysis and dynamic presentations turn ordinary money managers into trusted, on-site partners. The app provides advanced analytical insights to help reduce the time advisors spend on information gathering for existing clients. Advisors can now spend more time reaching new prospects. Trusted Advice equips wealth advisors with mobile tools to better serve clients. These tools can manage the agenda, make notes and review previous meeting output. When clients want to revise their investment strategy, advisers can easily input changes and use scenarios to project the outcome in real time. Wealth advisors using Trusted Advice can access market history trends and happenings to confidently suggest investment recommendations to their clients.